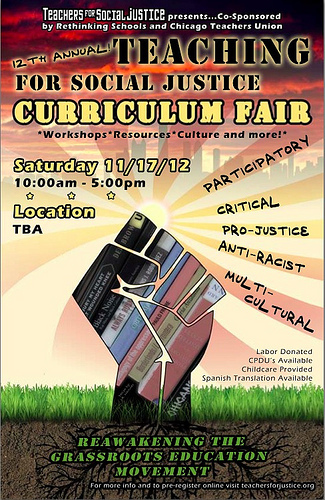 Teaching for Social Justice Curriculum Fair This Saturday! Teachers for Social Justice in collaboration with Rethinking Schools and the Chicago Teachers Union will be hosting the 12th Annual Teaching for Social Justice Curriculum Fair tomorrow, Saturday the 17th of November at a new location, Kenwood Academy High School. There will be speakers, exhibitions, and free curricula and materials made available all day, and check out some of the amazing workshops on the schedule. You can preregister online here. I’m so hyped!